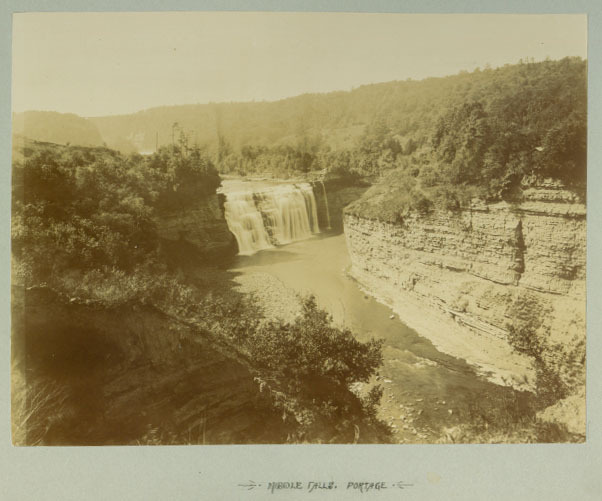 This image of the Middle Falls was taken around 1900. When compared to Image 28, taken forty years earlier, one can easily see the impact Mr. Letchworth had on the land he called the Glen Iris Estate. By the time this photograph was taken the natural beauty of the Falls was no longer hidden by a bridge, mills, and other structures. The signs of lumbering and farming had also faded from the river's banks. For closeups of several parts of the photographs, click on the image.